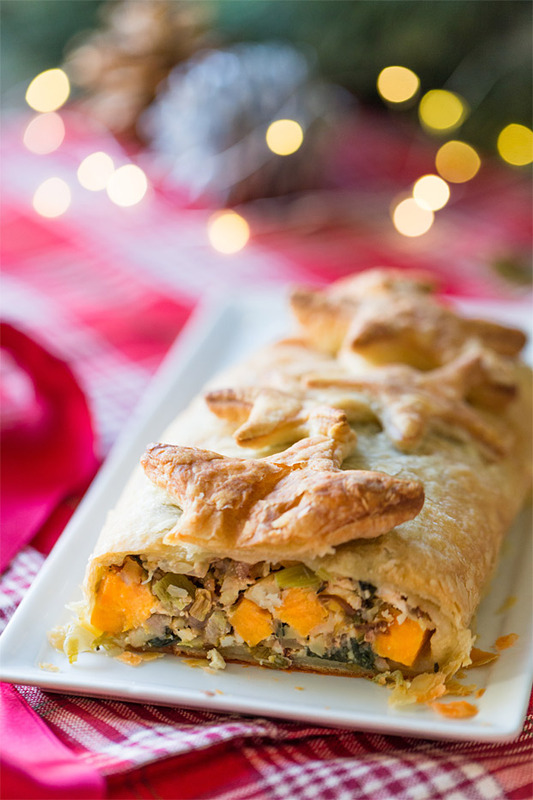 Vegetable Wellington – Feast on this! Well, this is it people – the big one! It’s our main Christmas meal this year – and we’ve held nothing back. 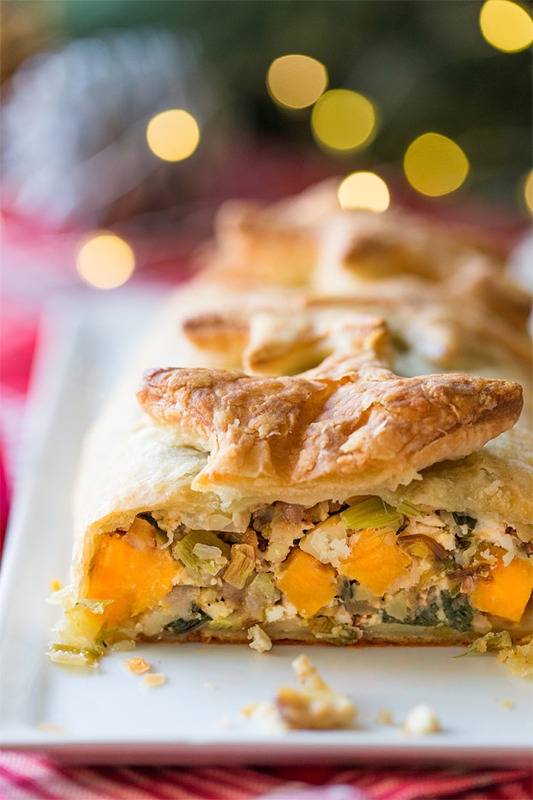 With drum rolls a plenty, we’re very proud to present: the vegetable wellington! With turkeys everywhere, certainly a joint of beef or two and even the odd goose, meat isn’t exactly in short supply at Christmas. It’s the time of year that can be tough on vegetarians (I still get the odd craving for pigs-in-blankets, but then I read this and remind myself why I don’t eat meat). When I say a tough time of year, obviously I mean in a food sense. And I think the main reason for that is the lack of alternatives. skip the ‘missed’ item altogether – for example we eat a Christmas roast, but without the main. eat a poor, packaged replacement we grab off the shelf at the last minute. give in and eat meat. While none of these are the end of the world, wouldn’t it be great to have something to look forward to for that special occasion that is the equal of, or even better than meat? 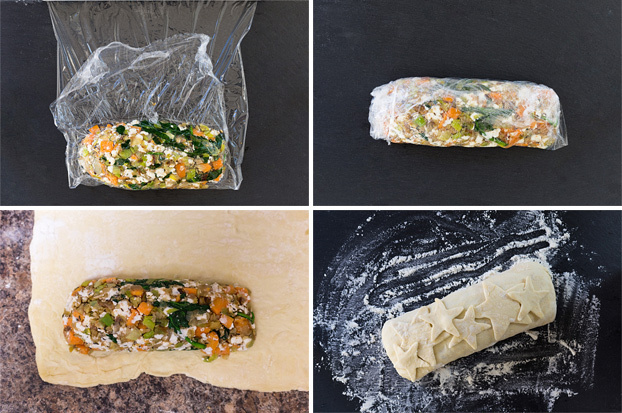 The vegetable wellington is the answer. This recipe has been lovingly developed and practised many times over the last few weeks, and we’re very pleased to put it out there. This alternative is here to show that vegetarians no longer get the short straw – indeed, we’re in this for the win. 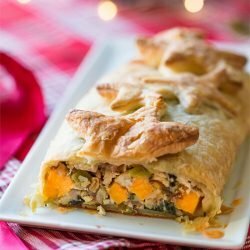 Vegetable Wellington – vegan or vegetarian? Vegans, don’t look away yet! This recipe uses only one animal product – a small amount of soft cheese. If that isn’t your thing, simply don’t add it. The wellington still tastes GREAT. 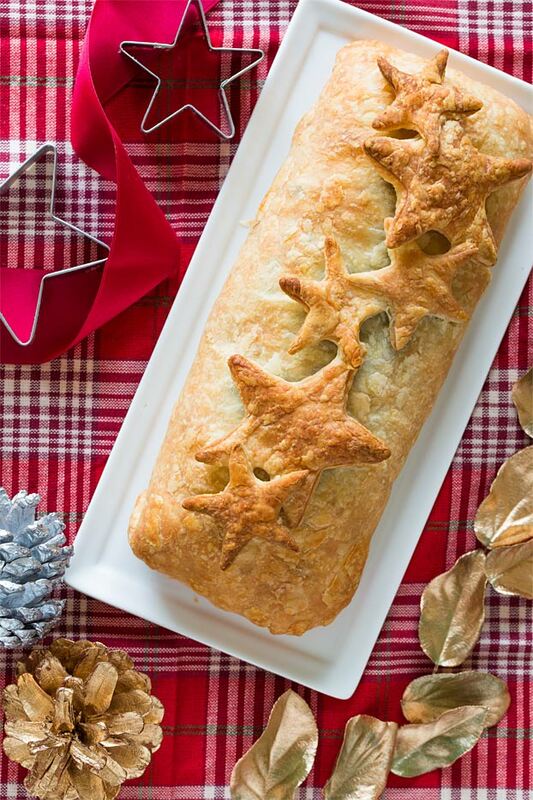 And of course, the veggie wellington isn’t just for Christmas – it’s perfect for any occasion where you want to replace a cut of meat. 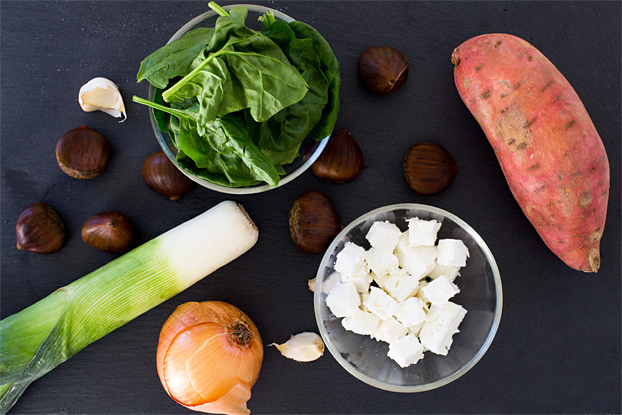 Normally at this point in time I’d tell you all about the health benefits of this dish, but the sweet potatoes speak for themselves, as does the spinach. Instead, as it’s Christmas I’m off to work on my veggie pigs-in-blankets. Dates wrapped in aubergine haven’t quite cut it – yet. But I’ll get there. Have a great Christmas! PS. 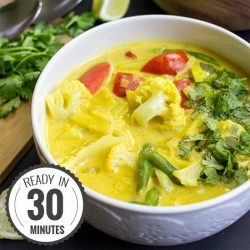 If you’re looking to go vegetarian, or are already vegetarian and struggling, make sure you check out the 30 Day Veggie Challenge – it’s everything you need to keep you on the right track! This veggie wellington alternative to the meat main course is not here to compete, it’s here to win. This is the future. Chop the leek and onion finely and fry softly in butter. While they’re cooking, dice the sweet potato and then add to the pan after five minutes, along with the garlic and thyme. Cook gently for another five minutes. Crush the chestnuts with a fork or masher and also add to the pan. Cook for another two minutes. 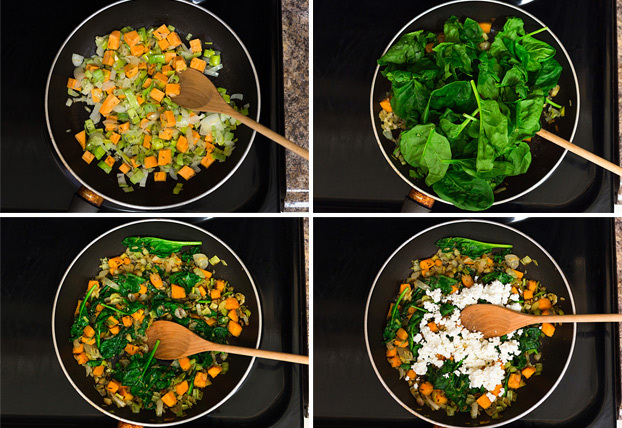 Finally, add the spinach and turn off the heat, stirring often. After it’s cooled a little, crumble the soft cheese into the mixture. Pour the cooled mixture into cling-wrap into a ‘log’ shape (one for each sheet of pastry). Wrap tightly and let cool in the fridge for an hour. Lay out your puff pastry and roll the filling into the middle. Use a brush a little water onto the edges of the pasty as you fold it together, then use a fork to squish the edges together. 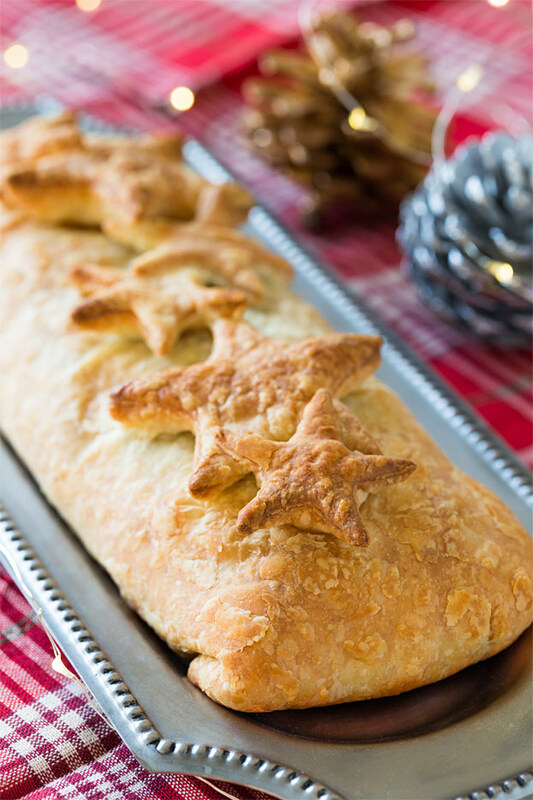 Cut off any leftover pastry into festive shapes and add to the wellingtons. If you enjoyed this, make sure you check out the rest of our Christmas collection. With everything from mulled wine to THE perfect potatoes, you’re in good hands. Are you able to make it so your recipes can be pinned? I’m able to save you as someone to follow on Pinterest but I’m not able to save this for future. Hi Sarah! Our recipes should be able to be pinned (I just tested a couple and they’re working fine). Could it be a browser blocker, perhaps? What happens when you try to pin at the moment? Thanks! Hi What temperature should the oven be? 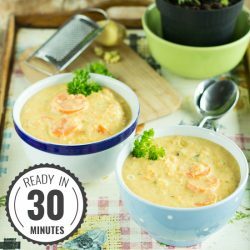 Hi, wanting to make this for Christmas meal, have you tried freezing or making in advance please? Hi Jane! I haven’t actually tried freezing it myself yet, but that’s a very good question, and I will. I think the best way to do it would be to cook all the ingredients and then place them in the pastry as usual. Then freeze. Then when you get it back out of the freezer the pastry will cook ‘fresh’ and the insides will be hot again too. I will definitely try this myself in advance, thanks for the question! This recipe looks great! I don’t think I’ll be able to find chestnuts where I live. Any suggestions for a substitution? Hi Jenny! Glad you like the look. If you can’t get hold of chestnuts (more and more places seem to sell them pre-cooked and vacuum packed these days) then I’d use another nut like walnut – chopped up. That would fit nicely. You could also try some smoked tofu – I haven’t tried it myself but I bet the flavour fits well! Hi there, it says roll into ‘a log shapes’ – is this meant to create 2 separate wellingtons with the 2 sheets of pastry?? Hi Sally, well spotted! Yes, these ingredients are to make two wellingtons – making about six servings. I’ll update that now! Enjoy! Does anyone have a tasty and easy sauce recipe to go with this please?